The Society of International Railway Travelers® proudly hails the Cruise Train Seven Stars in Kyushu as the latest of its World’s Top 25 Trains,® the first Japanese train to be so honored. Operated by JR Kyushu, the Seven Stars has astounded the travel world since its October, 2013 startup. Clamor for space is so great that JR Kyushu routinely holds lotteries to see who gets to ride. Winners pay up to $1,900 per person per day for the privilege. “The Seven Stars is a work of art on wheels,” said Owen C. Hardy, Founder and CEO of The Society of IRT, a Virtuoso® travel agency focused on luxury train travel since 1983. He tested the train in November. Hardy praised the train’s stunning design, locally sourced cuisine and off-train touring. And the English speaking staff “combines Asian elegance and hospitality with genuine warmth,” he said. The Seven Stars’ “World’s Top 25 Train®” status places it among such luxury rail legends as Venice Simplon-Orient-Express, The Pride of Africa, and the Golden Eagle Trans-Siberian Express. Owners and agency staff choose the trains based on direct inspection. Trains cannot pay to be included. The Seven Stars is the grand finale of the Society’s “Deluxe Rail Journey of Japan” tour running Nov. 5-19, 2016. 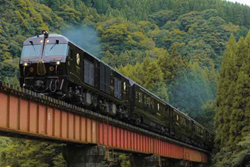 The Society is the first U.S.based travel agency to charter the Japanese luxury train. For more information, call (800) 478-4881 or (502) 897-1725, email tourdesk(at)irtsociety.com or visit http://www.irtsociety.com. Download IRT Society's "Deluxe Rail Journey of Japan" detailed itinerary. Tour runs November 5-19, 2016.